Sow little and often from April onwards and from March for bolt resistant varieties. Traditional maincrop. Deep red globes. Early variety that can also be picked as baby. 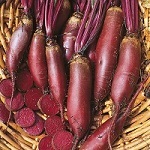 Often grown for its deep red foliage but also recommended for its eating qualities. Light red globes with pink and white ringed interior. As their name implies these are more cylindrical and grow well above the ground which makes them easy to lift. 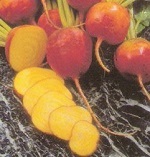 Early variety with smooth purple-red skin and purple interior. Orange skin and rich golden interior.